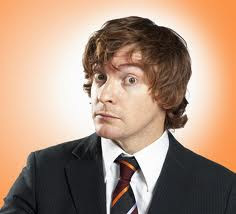 My favourite person, or one of the many, is Rhys Darby. He is a comedian from New Zealand, and hes the funniest guy ever. Hes quite famous in New Zealand but i don't know about America or anywhere else haha. I have both DVDs of two of his live shows and its the funniest shiz ever, i could watch them forever. He does lots of impressions, and heaps of sound effects like a helicopter, or a robot. It's actually amazing coz they sound REALLY realistic.